To Get Your Loved One Out Fast! Did you get a phone call in the middle of the night and find that a loved one has been arrested? It can be difficult to know what to do to help, especially in the hours immediately after the arrest. If you get a call, pick up the phone and call us for affordable bail bonds. Each bondsman in our agency is experienced in the courts and jails in the area, and will work tirelessly to get them released and back home as quickly as possible. If you have any questions about the process, and the best way to help your friend or family member, we’ll take the time to ensure you get the answers to all your questions and bail out your loved one with confidence. In addition to our genuine care to those with love ones who are incarcerated in times of need, not only do we have superior services, we’re here for the people and for their rights to freedom until proven guilty in the court of law. When you call we will get you released in a hurry. We pride ourselves on getting you out and back home where you belong faster than any other bonding company in the area. Call us 24/7 to get the answers you are looking for and get your loved one out of jail fast. We are dedicated to providing the best customer service, so call us with any questions you have about the process, or the jail, and we are more than happy to help by answering any questions you have. Do you think you may have an outstanding warrant? Whether it is a misdemeanor warrant or felony warrant our agents can help you navigate through the court system to smooth out the process and reduce or eliminate the time you spend in jail. Get back to your life, and don’t spend time sitting in a jail cell. It’s crucial for a criminal case that you get started immediately working with a lawyer and not spend time sitting a cell. Working with a professional bail bond agent speeds up the bail process, allowing you to get back home much quicker. 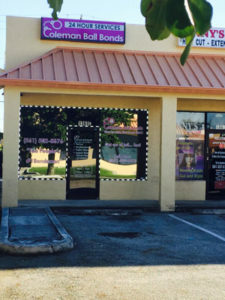 We are a professional bail bond company located in West Palm Beach, Florida. We have state licensed agents to service the entire United States. We are available 24 hours 7 days a week. Each one of our bondsman pride themselves on getting you released from custody faster than any other agency around. Don’t hesitate to call us if you have any questions about the process – we are here to help! Most people don’t have a good understanding of how a bonding company works, and how it can be extremely helpful during the hours immediately after an arrest. When you work with a bail bond agent for a bail out, as opposed to posting bond on your own, there are multiple benefits: You’ll have an experienced professional working on your behalf, you won’t have to come up with as much money, and the process will be much quicker. Do you have bail questions? Read our frequently asked questions, and give us a call or send us an email if you don’t find the answer. Our goal is to be the best bail bonds agency in the area, and helping you during the difficult hours immediately after an arrest is our first priority. There are many misconceptions about the bail process, and we seek to inform and educate people about the benefits of working with a bail bond company. Get them Back Home Fast! Call us 24/7, 365 days a year. We are available, because we know that arrests don’t happen during convenient times of the day, and you need help when you need help.